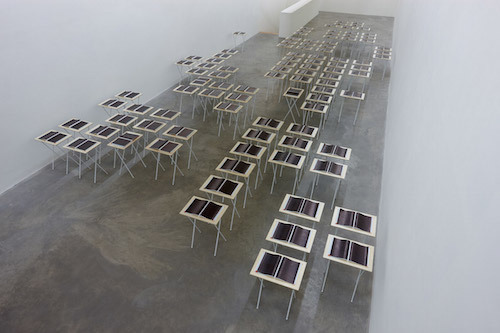 Kathy Prendergast, Atlas, 2016, 100 road atlases, ink, trestle tables, dimensions variable. The outlines of Ireland are clear enough, spread across two sets of pages, but navigating around the tables—which are laid out in a rough schematic of the continent, and further into Central Europe—additional moments of darkness appear. Are these voids seas, lakes, national parks, or perhaps just inhospitable places? Presented as a single installation, this is a powerful work—cultural differences are leveled, while the tiny white dots reveal the tenacity of human endeavor. Our relative smallness among mountains and oceans is utterly laid bare.